The need for remote control came with the SDR revolution. SDRs are connected to PCs. PCs can be remote controlled, giving the DX-er the opportunity to listen to live and recorded DX on his remote and RFI-free DX-location. Currently I have three PCs in Kongsfjord operating one SDR each, plus one SDR in cloud mode. I connect daily, and several times a day, from my home in Vadso. I've used LogMeIn Pro since - when? 2007? At that time there was a Free version of LMI but audio was not supported so a pro license was required. LMI pricing is one license per PC on an annual lease, and the fees have increased quite a bit in recent years. So when my last set of licenses put me back USD 250 last year, and with the coming year to increase the tab with another 100 dollars for my five PCs, I decided to check for alternatives. Corporate, for large teams in need of simultaneous connections. Obviously, for the "individual" DX-er with a few PCs in his radio shack, the free version was the one to test. Teamviewer is extremely easy to set up and configure. You're allowed to "quick connect" with username and password preset, and you can specify that the PC be used for remote control. All accessible PCs are listed, and connection is fast - actually faster than LMI. The connection window allows tabs, allowing each remote PC (if more than one is connected) to be selected by clicking the tab). All connected PCs are active, you do not need to "pause" the others to use one. 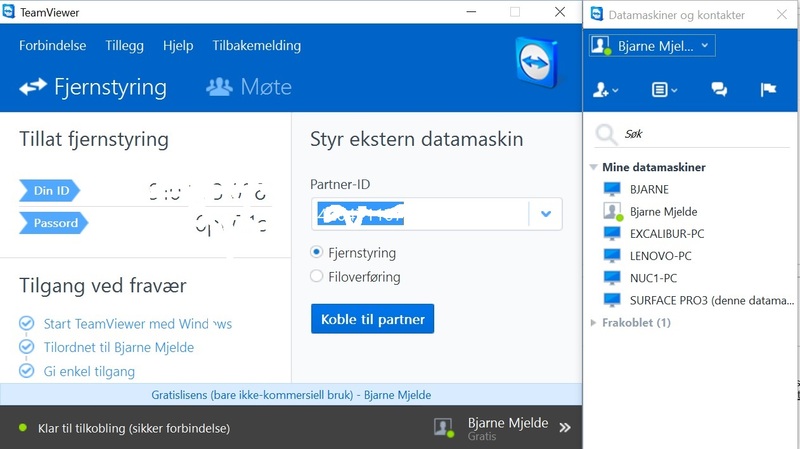 Teamviewer control centre, in Norwegian guise. "Tilllat fjernstyring" is "Allow remote control". "Gi enkel tilgang" is "Give easy access"
Like LMI, Teamviewer can also be installed on a memory stick, allowing you to run Teamviewer from any PC (even a protected corporate PC) from its USB port. Various mobile devices are also supported. Another surprise was that not only did Teamviewer connect quicker, it appeared that the remote PC responded quicker to I/O commands. I gradually introduced Teamviewer to all my remote PCs (ironically enough with the help of LMI), and I'm now using Teamviewer exclusively. Audio quality is no worse than LMI. With the exception that sometimes I experience audio pops at a rather random rate. Noticeable, but not really disturbing. I'm tempted to rate the video quality as better than LMI. A downside is that I need to reconfigure the video output on a couple of my PCs as Teamviewer apparently doesn't remember previous settings. It only takes a couple of seconds though. Each session is limited to 120 minutes, and you will be disconnected. However, you can reconnect for another 120 minutes etc, and I'm very rarely connected that long. Another thing to be aware of is that each session is ended with a dialog box that must be clicked "OK" (or "Buy" or "Like" if you so prefer). Again, no big deal since the dialog box doesn't stop any processes. There may be a limited number of PCs that are supported with the Free version. I haven't found any info on that. But I haven't reached that limit yet with my six Teamviewer PCs. So the bottom line is: Teamviewer is an excellent (and free!) tool for controlling your remote PCs. Heard in October 2015, a facebook response came this evening. 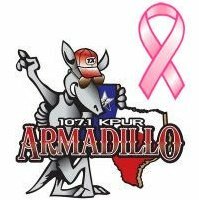 No logo found for the AM, so here's the one for their C&W FM station. The evening of February 3 was a good time for hearing stations on daytime power. Such as WNDZ which faded up through CBGY with a perfect full-hour ID. 15 kW directional to the northwest, but enough juice in the northeast direction to make it to Kongsfjord. Thanks OJ for spotting it. Fine reception of this Oldies station on February 2, and a fine Word QSL received today. A surprise catch on January 31, quick email response today. Facebook response from a January 22 reception.